The impending and current times (the present times) will be hard, fierce, violent, perilous, dangerous, grievous, harsh, painful, and difficult . . .
52 million abortions since 1973 . . . and this word and meaning was coined in biblical times . . . to address end times where THIS would happen . . .
Truce-breakers – not willing to make shalom (peace) or come to an understanding . . . unforgiving . . . implacable . . . unappeasable . . . It is a sin of rebellion . . .
ACCUSERS – set against – enemies . . . . slanderers. People that accuse falsely with no witness or backup . . . Devils . . . ie, the word used: diaboloi . . . Satan. Without Self Control – giving power to – letting proclivities master you – giving “lordship” to things such as lust, lies, stealing, and a whole list of UN-Holy things . . .
4 APOSTASY – Turning from God towards sin . . .Traitors – betrayers of God. Causing the Holy to desecrated . . .
IMPULSIVE – rash – reckless. To fall . . .
DELUDED – CRAZY – DEMENTED – conceited – puffed up – BLINDED – FOOLISH. (proud people knowing nothing) – Foolish pride . . . and pride leads to Sheol. PLEASURE-SEEKING – to love and have strong affection for LUST and its PLEASURES. (It has the connotation of REPLACING one’s love for GOD)The God loving person allows NOTHING to infringe upon his DEVOTION TO GOD which is the opposite of this word . . . This is quite an ugly list . . .
A heart breaking list . . . Become Aware of it . . .
Be conscience of it . . . Understand it intellectually . . .
One reason is VERY CLEAR . . . so you can AVOID BEING THIS PERSON! The second reason is hard for some to come to terms with . . . . in the final verse, we are given a WARNING: SHUN these people! TURN AWAY from them! Turn your face away from them! Other than the obvious . . . is there another reason? 5 They possess – cling to – hold . . . but notice the word in the Greek . . . it is significant to understanding – ECHO . . .
a “form” – appearance – semblance . . . it is perceived by others that they have . . . but is actually deceptive concerning the INWARD reality . . . an ECHO . . .
Of Piety . . . godliness. Reverence towards God and His commands. It means RIGHT CONDUCT before GOD. the Power, might and strength of living with RIGHT CONDUCT before GOD. FROM them, we should turn our face – turn away from. Is it any wonder with these OUTWARD believers . . . These believers that present an outward ECHO of right conduct before God . . .
people that will have nothing but an ECHO of right conduct before God . . . 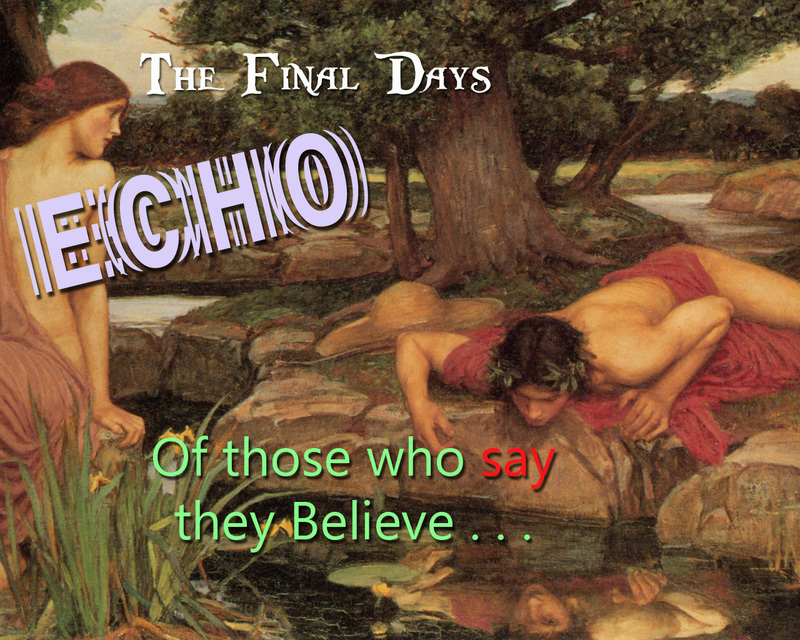 Yes, they will have an ECHO . . . Complete Biblical Library Greek and Hebrew Dictionaries were used to expound and amplify. This entry was posted in History, Verses, Word Studies and tagged 2 Timothy, echo, end times, last days, never knew you. Bookmark the permalink.